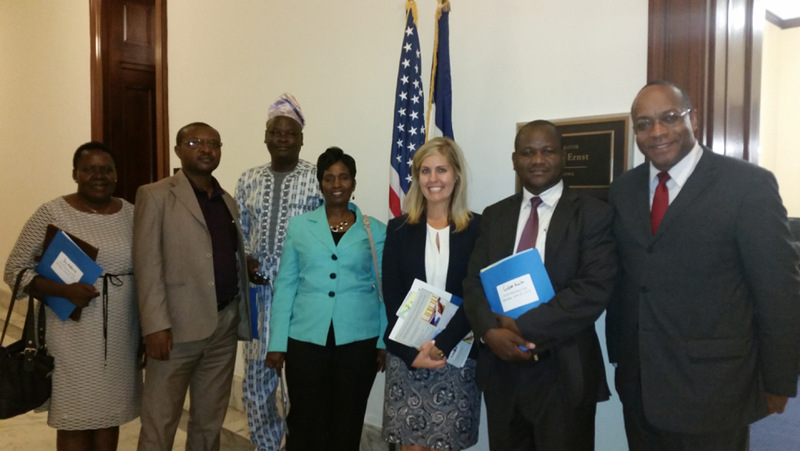 Following the conference on June 20, 2016, three teams of CCIH advocates visited offices on Capitol Hill to discuss the importance of U.S. foreign assistance and the work of Christian organizations in global health. One team visited the offices of Representative Dave Rouzer (R-N.C.), Senator James Lankford (R-Tex. ), and Representative Barbara Comstock (R-Va.). A second team visited the offices of Senator Mark Kirk (R-Ill.), Representative Ed Royce (R-Calif.) and Senator Joni Ernst (R-Iowa). The third team visited the offices of Senator Lindsey Graham (R-S.C.), Senator Ben Sasse (R-Neb. ), Senator Roy Blunt (R-Mo. ), and Senator Jim Risch (R-Idaho). The 20 CCIH advocates came from Benin, Cameroon, Kenya, Nigeria, and Zambia; and Colorado, Maryland and Virginia in the United States. CCIH sponsored a briefing on June 21, 2016 with members Adventist Development and Relief Agency, Samaritan’s Purse, SANRU and World Vision on the work of Christian organizations in Maternal and Child Health, attracting 64 attendees, including many from Congressional offices. Joseph Menakuntuala, Project Director, JENGA II, Democratic Republic of Congo (shown to the far right in photo) presented on ADRA’s USAID Title II Food and Security programs, which focus on the time between the 1,000-day window beginning at conception through integrated maternal and child health and nutrition strategies and interventions. Dr. Hélène Mambu-ma-Disu, SANRU Board Member and Senior Program Officer for the Sustainable Immunization Financing Program of the Sabin Vaccine Institute (shown third from left), presented on how SANRU’s partnership with the Ministry of Health in the Democratic Republic of the Congo (DRC) to mobilize faith-based networks and its role serving as a principal recipient of funds from GAVI, the vaccine alliance in DRC help contributes to stronger health systems and supply chains for immunization. Melanie Lopez, Program Management Officer, Health and HIV, International Programs Group, World Vision (second from right) described the organization’s work with religious leaders in Garba Tulla, Kenya to help pregnant mothers thrive during their childbearing years and have access to antenatal and delivery care and information about timing and spacing their pregnancies. Cindy Uttley, RN, CNM, MSN, Community Health Advisor, Samaritan’s Purse (third from right) explored how the organization’s Infant and Young Child Feeling Project, funded by the Office of Foreign Disaster Assistance, helps provide clean water, sanitation and hygiene to people in South Sudan. 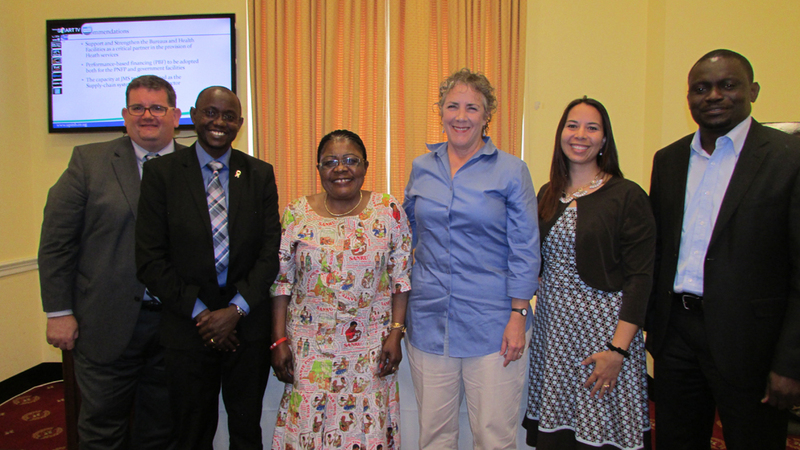 Tonny Tumweesigye, MD, MPH, Executive Director, Uganda Protestant Medical Bureau (second from left) presented how UPMB builds bridges to work with other groups to provide crucial health services in Uganda by working collaboratively with Catholics and Muslims. The briefing was moderated by J. Mark Brinkmoeller, Director of the Center for Faith-based and Community Initiatives, USAID (shown to the far left in above photo). See more photos in the Facebook album from Advocacy Day and the Capitol Hill Briefing!